So, I’ve been wanting to try something different for a while now. I mostly make dresses and tops, and my attempts at pants have been mediocre at best (they, and tailored jackets, are my kryptonite). And then, while just stumbling around blogland one day, I spotted Tania. 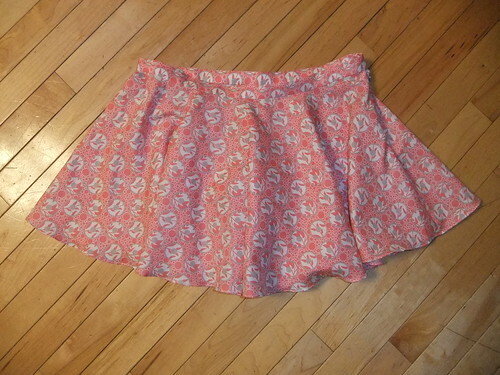 A cute, flirty skirt that is actually shorts and won’t show your business to the world if the wind picks up? Sign me up. I wanted them. On ma body. But, why buy a pattern when I could try to figure it out myself? There are a few independent pattern companies that I love, and I do my part in supporting them by acquiring their patterns at up to $22 a pop, but this particular one just seemed too fundamentally simple (yet genius; giving credit where credit’s due) for me to shell out for. And then Pinterest came in. You know, that place where you pin all of the million things that tickle your fancy which you will never, ever, get to. Well, not all of them. It’s like a happy land of lost dreams that never come to fruition. Uh, anyway, I had pinned these marvelous culottes and happened to look at the “related pins” which I don’t recall ever having done before. And that’s where I found this tutorial from Petit Main Sauvage. I made them fuller. Tania is clearly at least a full circle skirt (and from my finished product, I feel that is exactly what it is), and Petit’s tutorial creates culottes that amount to a half circle skirt. Inge made a lovely pair of culottes from the tutorial, and you can see that they’re not quite as full as Tania is. To do so, when I calculated the waistline, I took my waist measurement, subtracted 1/2″ to compensate for bias stretch, and then divided by 2 x Pi, AKA 6.28 to find the radius of the waistline circle needed (no multiplying by 2 first). The same as you would do to calculate the waistline on a full circle skirt. Then, each pattern piece was a full 90 degree section of the circle. Not half of one of the sections, as shown in the tut. Then, I followed the directions for adding the inseams and crotch and outlined in the tutorial, which worked out wonderfully. 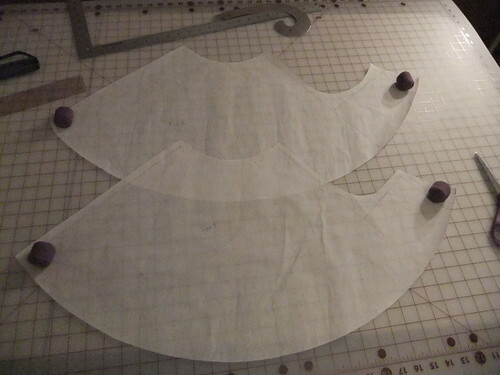 However, instead of having them extend squarely from the edge of the skirt, I measured from the center of the circle used to draw the waistline, and had the extensions curve up, following the line of the circle. Am I losing anybody yet? I used an invisible zipper as my closure and made a 1″ tall waistband, with a small tab extending over the opening, and hemmed with my baby hem foot (holla at ya, baby hem foot, you rock!). If I had it to do over again, I wouldn’t put a button on the outside; instead, there would be a button on the inside and a large hook and eye under the edge of the tab, like most dress pants. The fabric is some random poly shirting fabric I got a while ago from Fabric.com. 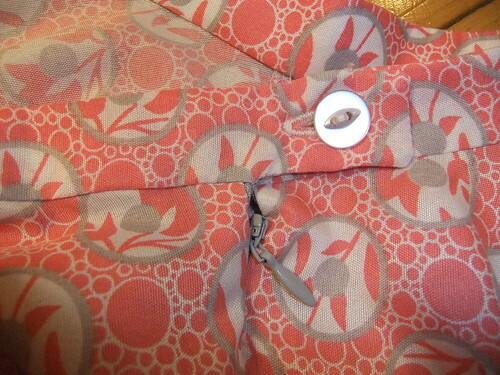 You may recognize it as the same fabric I used in the Truffle I wore during Me-Made-May. 1. Waistline. I’m a fan of low rise bottoms, because otherwise I feel like my stomach fat is being encased. However, in the case of these free flowin’ culottes, I should’ve made these puppies go all the way up to the waist. They just look wrong, and make me look quite square in their current position. I tried tucking a shirt in and it was like I had a Texas sized muffin top. No bueno. 2. Length. They feel a bit inappropriate as-is. Tooooo short for me. But, they’re my first shot at them, so we’ll just say they’re a wearable muslin. I’m thinking 3 inches longer and I’ll be able to wear them in public. All in all, I think they’re pretty cute, though. And the next ones will be even better. Thanks to Ms. Nielsen for the wonderful inspiration! p.s. Forget my sunglasses were on my head the whole time. Ha. Tagged completed, self drafted, shorts, WOOHOO! I agree that they are a little too short but I love love the concept. They look great! (but yes I agree just a tad short). At first I didn’t even know they were shorts! You did a great job and awesome to getting a free tutorial! Woah hadn’t thought of drafting my own! I am so going to copy who you copied who they copied who they copied! Brilliant. Also, I like ’em short! These look great! I’m glad you found my tutorial useful. And thanks the comment with the link to your culotte post. For my first pair of culottes, I used fairly bulky wool, so I didn’t want them too full. And full circle anything takes a lot of fabric. That said, I always meant to do my bit to de-mystify drafting culottes and hopefully inspire other people to put their own spin on the garment. I think how you drafted the crotch and inseam works great. This way you get the true skirt look, even without pleats. Thanks for stopping by, Zoe! They would’ve been the perfect length for 16 year old me, too! Amazing that they’re self-drafted–really impressive. I think they’re shorts length, so they’re not too short for shorts, if you see what I mean. Good job! Hey Wendy! Yeah, I’m picking up what you’re putting down. I agree, shorts-wise, not so terribly short. Fab – u – lus!